The Portland Mercury‘s Portland Burger Week is August 13-18! Fifty local bars and restaurants have created 50 delectable burger specials and are offering them for just $5, for one week only. [UPDATE: Looks like we’re down to 49 restaurants–East Glisan Pizza Lounge dropped out.] But as far as I can tell, only 29 of these fair establishments allow minors (if you have corrections, please add your kind remarks to the comments). Many of these places will be incredibly busy. That means long waits, sellouts, the works. Be prepared, and have a backup plan if your kids get antsy. Just because these places allow minors, it does not mean they offer kids menus. Many of these burgers are not super kid-friendly: they include (delicious!) spicy sauces, fermented veggies, and other exotic garnishes. Check the menu beforehand, and whatever you do, do not try to browbeat the staff into making an off-the-menu grilled cheese. Be mindful of your time. I don’t mean wolf your burgers down, but please be aware if there are lots of people waiting for a table. This is not the time for a lengthy stay. Tip, and tip well! Everyone knows that servers are generally tipped a set percentage of the total of the bill. Everyone knows these burgers are only $5–lower than normal burger prices. Take the money you’re saving and gift it to your overworked server–it’ll earn you good burger karma! Aji Tram Shaanxi Classic: Waygu ground beef patty with chopped pork belly, Chinese spices, cilantro aioli, lettuce, pickled chilies, and white cheddar on a grilled bun. Alameda Brewing Co. Haole Burger: A seasoned and grilled hamburger patty, with teriyaki-marinated grilled SPAM. Topped with a grilled pineapple ring, American cheese, and lettuce, with Sriracha aioli. Alberta Street Pub Can’t Banh Mi Love: Carlton Farms seasoned pork patty loaded with ginger, lemongrass, rose bean curd, cilantro, and Thai chilis. Served on a pub bun with fresh jalapeños, cilantro, pickled veggies, and sweet chili aioli. Bar Bar (minors welcome until 8 p.m.) Over the Rainbow Burger: 100 percent grass-fed, local beef patty, with teriyaki sauce, fresh pineapple rings, melty provolone, Canadian bacon, and lettuce on our classic potato bun. BRIX Tavern (minors welcome before 10 p.m. except on Wednesdays, when the cutoff is 9 p.m.) The Norm: Smoked Tillamook cheddar fondue, shredded lettuce, tomatoes, caramelized onions, and house sauce. Burnside Brewing Co. (minors welcome until 10 pm) Cornholio Burger: A quarter-pound patty, roasted corn relish, smoked jalapeño cream cheese, garlic aioli, and chicharrones. Church (minors welcome until 9 p.m.) New Black & Blue: Black and blue fondue, shaved iceberg, and carmelized mushroom. danwei canting Spicy Tails & Trotters Pork Burger: Fermented cucumber, Napa cabbage, and Chinese mustard, dusted with a spicy blend of chilies and Sichuan peppercorn. EastBurn (minors welcome upstairs only) Eastburn Big Mike: Local grass-fed beef, aged smoked gouda, housemade secret sauce, fried pickles, and shredded lettuce on a potato bun. Foster Burger The Jimmy Pesto: A nut-free pesto and mozzarella-topped burger with dressed arugula and fresh tomato. HopCity Tavern Sofia Burgara: Pretzel bun, roasted garlic aioli, third-pound all-beef patty, Tillamook smoked cheddar, grilled onions, pickled jalapeño, heirloom tomatoes, and arugula. The Hostel Cafe Cuban Immigrant Burger: A grass-fed beef burger layered with Swiss cheese, smoked ham, and sliced dill pickle on a brioche bun with Cuban aioli. Kells Brewery (minors welcome until 10 p.m.)Irish Breakfast: Irish soda bread, bangers, egg, bacon, baked beans, fried tomato, Kells Irish stout, beef, and zesty aioli. Kim Jong’s Smokehouse Cheeseburger Steam Buns: Burger patty, American cheese, special sauce, sesame bun, and shedded iceberg. Las Primas ¡Papa a la Huancaína Burger! 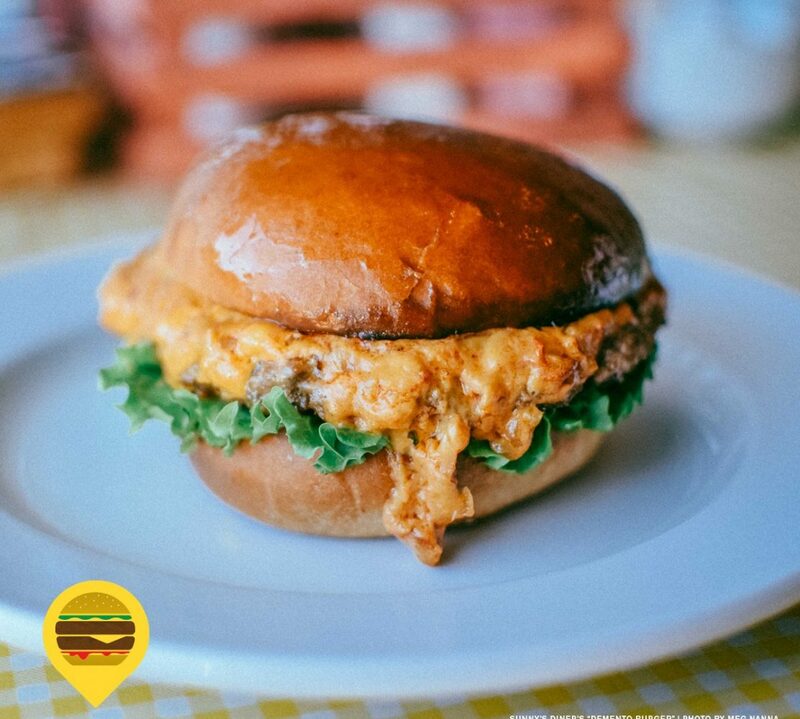 : Our Peruvian-seasoned quarter-pound beef patty is grilled to perfection and topped with lettuce, fried potato, and pepperjack cheese, then slathered in huancaína (a creamy chili pepper and cheese sauce) and finished off with a botija spread. Lightning Will Bar & Grill (minors welcome until 9 p.m.) The Bobby Boucher: Creole seasoned 1/4 lb. patty, served on bun with a New Orleans style remoulade, lettuce, tomato and cheddar. Lompoc Tavern Umami Burger: A six-ounce patty of our custom blend, all-natural beef topped with an umami spice blend, ginger teriyaki sauce, and sesame slaw. Loyal Legion It’s Nacho Problem: Nacho cheese sauce, pickled jalapeño, tortilla strips, shredded lettuce, and tomato. Migration Brewing Co. (minors welcome until 10:00 p.m.) Taco ‘Bout It: Seasoned pork and beef patty, hatch chili aioli, southwest slaw, tortilla strips, and cotija. New Seasons Market The Block Party: Carmen Ranch grass-fed patty, creamy Tillamook cheddar, sweet Walla Walla onions, Felton & Mary’s BBQ sauce, bacon, pickles, lettuce, and tomatoes stacked on a pFriem Wit Ale bun. Next Level Burger Peachy Portland Burger: A Beyond Meat patty seasoned with Next Level Burger’s super-secret seasoning, topped with organic grilled peach, melted provolone, caramelized organic onion, organic red leaf lettuce, and smoked peach aioli. 100 percent plant-based. Nick’s Famous Coney Island Sweet & Spicy Carnival Burger: A locally sourced, 100 percent ground-chuck patty with a spread of sweet and spicy jalapeño/bacon/brown sugar jam, with a layer of red onion, “Carnie” creole sauce, onion rings, pickles, fresh shredded lettuce, and topped with a mini corndog dashed with mustard and topped with a chipotle mayo dressing. Noraneko DanDan Burger: Spicy, tingling hamburger patty with preserved vegetables and cold sesame noodle sauce. Oaks Bottom Public House LSD BBQ Burger: LSD BBQ Sauce, quarter-pound seasoned beef patty, fryer onion straws, and slaw on a pub bun. Portland Burger Simon Bar Sinister: Roasted poblano elixir of broken minds, charred sweet pepper slaw of delusion, pepperjack cheese of lunacy, crispy fried onions of agony, raw onions of eternal rage, and a Southern garlic butter baste of hysteria. Smokehouse Tavern Pulled Pork Torta: Burger patty, pulled pork, chicharon, whipped avocado, and pickled onion, on a potato bun. Stoopid Burger Crazy Carl: Onion rings, fries, honey mustard, and Swiss and American cheese. Sunny’s Diner Demento Burger: Toasted housemade burger bun, Sunny’s demento cheese, half-pound all-beef patty, lettuce, and onions. Tilt (East Burnside Bridge) Piggy Walls Burger: Tilt Sauce, chicharrones, egg, monterey “cheese bomb,” pork belly, beef patty. Ya Hala Beef Falafel Burger: Fresh ground beef with cheese, garbanzo and fava beans, coriander, cumin, garlic, parsley, and cilantro on a brioche bun, with lettuce and topped with refreshing tzatziki. Zoiglhaus Brewing Company How Do You Say Hamburger in German? : Frizzled sauerkraut, Swiss cheese, caraway aioli, and beef patty on brioche. Finally: if you find a burger you love, come back and tell me about it in the comments!